Irish poet Dennis O’Driscoll is known for “Stepping Stones,” his series of interviews with Seamus Heaney. Image from the Rose Library collections at Emory University. Rose Library also recently acquired “Mosada,” the first play by W.B. Yeats. Image from the Rose Library collections at Emory University. 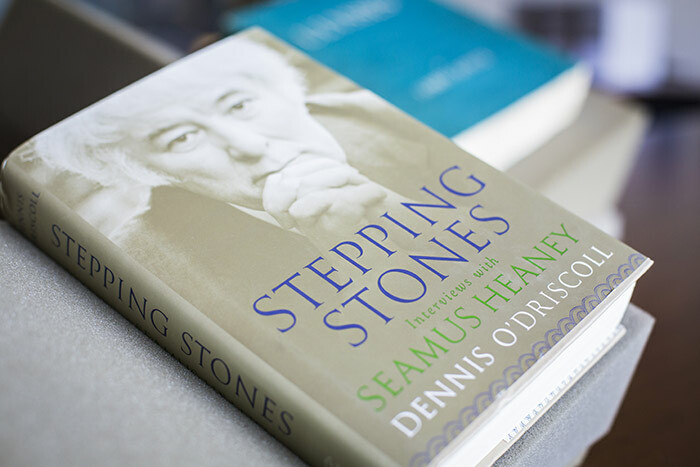 Thursday, Feb. 1 at 5 p.m.
Building on the strengths of its Seamus Heaney collection, Emory’s Stuart A. Rose Manuscript, Archives, and Rare Book Library has acquired the papers of poet Dennis O’Driscoll and historian Roy Foster, further enhancing one of the strongest Irish literary collections outside of Ireland. O’Driscoll, known for his extraordinary series of interviews with Seamus Heaney that became “Stepping Stones” (2008), published nine books of poetry, three chapbooks and a collection of essays and reviews. “O’Driscoll’s newly acquired papers immeasurably enrich the Rose Library’s Seamus Heaney collection, as well as the literary village of Irish poets, novelists and critics in Emory’s archives,” says Geraldine Higgins, associate professor of English and director of Irish Studies at Emory. O’Driscoll’s papers join those of Rita Ann Higgins, Edna O’Brien, Paul Muldoon and many others. Foster influenced the Irish historical imaginations by expanding both the public and popular perceptions of the past, commented award-winning Irish writer Colm Tóibín during his November visit to Emory to deliver the 2017 Richard Ellmann Lectures in Modern Literature. Other notable acquisitions to the Rose Library include the first play by W.B. Yeats, “Mosada,” and a first American edition of “Pomes Penyeach” by James Joyce. Only 20 known copies of the Yeats play still exist from an original printing of less than 100, and this one has a personal inscription from Yeats to a school friend. To secure the American copyright for the Joyce poems, 50 copies of this 1931 edition were printed in the U.S. The 13 poems are arranged chronologically on 17 pages in this slim volume, with each poem accompanied by the date and location of its composition over a 20-year period. 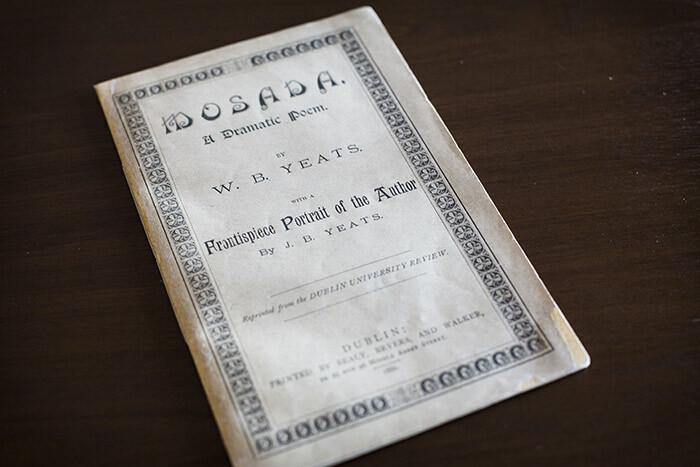 “There is no doubt that the histories of Irish poetry from Yeats to Heaney will be based on the numerous archives of Irish writers, north and south, in the Rose Library,” says Ronald Schuchard, Goodrich C. White Professor of English Emeritus.